Home / Can My Vendors Print Shipping Labels with ELEX WooCommerce DHL Shipping Plugin? In recent times a lot of users using our ELEX WooCommerce DHL Express / eCommerce / Paket Shipping Plugin with Print Label in their multi-vendor store are willing to let their vendors print their own shipping labels. This is probably because, if you are running a multi-vendor online store, you’ll have multiple vendors and these vendors are going to have different billing addresses. They might be in different time zones or shipping packages at different times of the day. And, if the number of vendors is large, printing shipping labels for them on your own can be a tough task. You’ll also need to send the generated labels manually. So you can actually consider this and let your vendors print shipping labels. One way to do this is to use ELEX WooCommerce DHL Express / eCommerce / Paket Shipping Plugin with Print Label itself. The plugin allows the website’s ‘Administrator’ and the ‘Shop manager’ to print labels from within WooCommerce. So if you create one shop manager (user role) for each of your vendors, they can print their shipping labels whenever they want to. Usually, a Shop manager has a lot of predefined capabilities and you may not want to give these access to an unknown person, so you can use an access management plugin and manage these capabilities. You’ll require the following plugins to let your vendors print shipping labels on their own. I am assuming that you are using one of the multi-vendor plugins that are compatible with our ELEX WooCommerce DHL Express / eCommerce / Paket Shipping Plugin with Print Label and have added your Vendors. And if you are a new user, trying to use our shipping plugins with these multi-vendor plugins install our Multi-Vendor Add-On for XA Shipping Plugins to fetch vendor data from your multi-vendor plugin. How Can Your Vendors Print a Shipping Label? Apart from the Administrator, only a Shop Manager can print shipping labels using ELEX WooCommerce DHL Express / eCommerce / Paket Shipping Plugin with Print Label. Printing of labels by vendors will require access to any of these accounts. Preferably you can create one Shop Manager account for each of your vendors so that they can log in using their Shop manager accounts and print labels when they need. 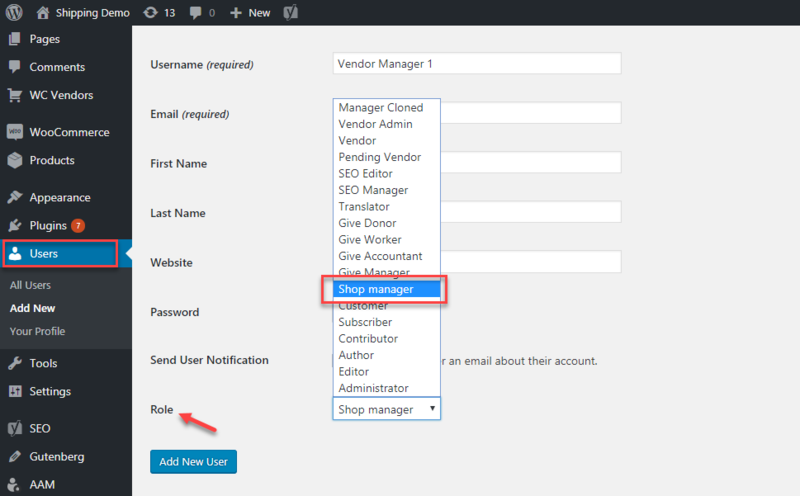 To add shop managers, navigate to your WordPress Dashboard> Users> Add New and choose the role of Shop Manager. Add necessary details in the boxes provided and finally click on Add New User to save changes. You can also edit existing user roles. Since a shop manager has a wide access to your shop, you might want to limit their access to printing labels only. You can do this with the help of an access management plugin. In this case, we are using ‘Advanced Access Manager‘. The plugin is quite helpful when it comes to restricting certain capabilities from the user roles. The plugin has as many as 197 capabilities listed in its settings. You can uncheck capabilities that you don’t want the shop manager to have. You also need to be careful while selecting the capabilities as a lot of capabilities are interrelated. For instance, the capability of ‘edit_shop_order’ will function properly only if the capability to ‘manage_woocommerce’ is allowed. Also, if you don’t check ‘read_products’, the user will not be able to read any of the products even if he has access to ‘manage_woocommerce’ in the plugin. So make sure you give all the necessary capabilities to the ‘shop_manager’. This is how a Shop manager’s dashboard may look like in your multi-vendor store. Multi-Vendor Plugin Add-On helps you generate shipping labels via. shipping plugins by ELEX when you deal with multiple vendors. The plugin fetches necessary details from the vendors and connects them to ELEX WooCommerce DHL Express shipping plugin with Print Label. This plugin is an add-on and does not work independently. The plugin is available in the WordPress Repository for free. So your first step towards setting up our shipping plugin for a multi-vendor plugin should be to install the add-on so that you get the option of the sender address. 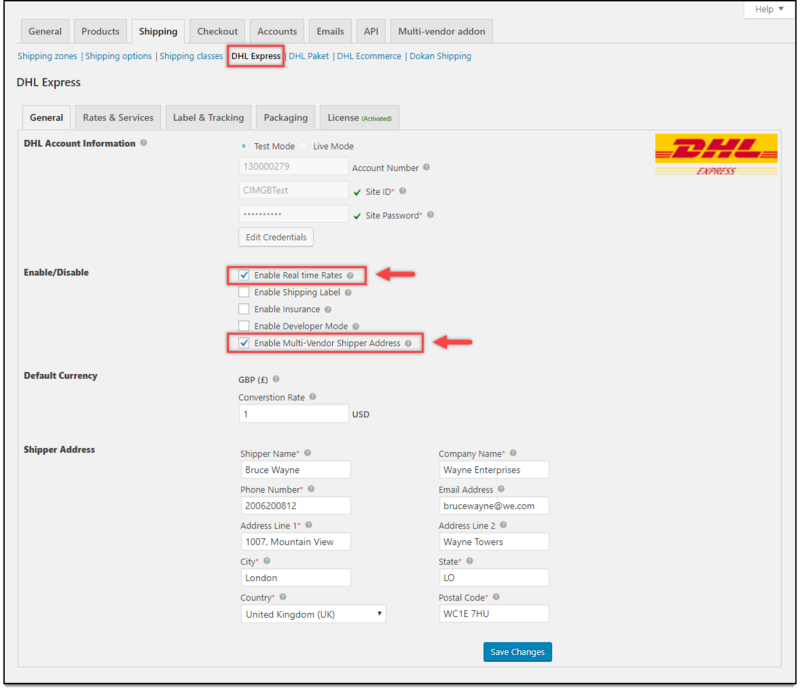 In the General tab, enable the Real-time rates setting to access DHL rates, and enable Multi-Vendor Shipper Address setting to override shipper address set in multi-vendor plugin settings with the DHL Shipper Address specified in the DHL plugin, as shown in the screenshot below. A Shop Manager can print shipping labels from the WooCommer DHL Shipping Plugin with Print Label. As the Shop manager gets the access to, he can log in to your website and move to WooCommerce. The process of printing the shipping label is just the same as done by an Administrator. The Shop manager logs in to the store and get to his dashboard and navigates to WooCommerc> Orders> Order Number. Clicking on the order number opens the order details. As you saw that WooCommerce DHL Shipping Plugin with Print Label makes printing of label an easy task. With the plugin, you create the user ‘Shop manager’ who can print shipping labels. Visit the product page for more information, or contact our Online Support for any technical issues or pre-sales queries. Happy Selling!